I have a serious, serious problem. I’m addicted to baking for people. Be it my classmates, roommates, family or co-workers, I cannot stop. It has gotten to the level that it is unhealthy and I am in the kitchen for five hours straight. I am surprised my oven hasn’t exploded yet. The worst part? I ENJOY IT. At least I’m not in denial anymore. That’s the first step towards recovery, right? As some of you know, I’m interning at the Ottawa Citizen this month. This means that I haven’t been at home with my family for the traditional holiday build-up. Logically, I decided to recreate Christmas home time for myself here in Ottawa. That means lots and lots of baking. Even more than usual. Anyways, my co-worker Matthew and I were in cahoots one day over email and decided to start #operationcovertcookie. I told him that I was planning on bringing cookies into the newsroom one day, and he said he would join me. Then a flash of what I can only describe as pure genius struck him: a top secret cookie FLASH MOB. People love cookies. People love flash mobs. This plan was brilliant. Matthew and I got a few of our other co-workers on board, and we decided on the time for our operation to get underway. 13hr30 Wednesday afternoon. Close enough to Christmas that it’s appropriate, but on a random enough day that people are still surprised. Since I have this perpetual need to impress people through baking, I decided to bake three different kinds of cookies. The latter recipe was a real doozy and made – wait for it – five dozen cookies. Le sigh. What a first world problem, having too many cookies. Luckily Twitter is a wonderful cookie-getting-rid-of tool, and I quickly disposed of (if that’s the correct word) a dozen of them. What are friends for, right? Anyways, #operationcovertcookie was a HUGE success. We didn’t wear black unitards nor did we don fake cheetah print (both were suggested undercover outfit choices), but it was fantastic nonetheless. – If you’re prone to eating several cookies worth of raw dough (guilty, guilty, guilty), you will eat EVEN MORE when said dough is vegan and doesn’t contain raw eggs and other things that are normally supposed to be bad for you. The ginger cookie dough was unreal. Plan to eat at least 1/8 of it pre-baking. – You may have to explain to the clerk at your small, local corner store what Smarties are. You will motion frantically at the M&M’s and say they’re similar and then draw out a spherical shape with your hands. You will ask if they have Christmas-themed Smarties, which will confuse him even more. You will then proceed to buy the normal M&M’s and pick out the green and red ones. – When trying to be sleuth bringing cookies into an open-concept newsroom, don’t bring a Tupperware that is the size of half of Texas. See, if I didn’t have a baking problem this wouldn’t be an issue. Related: people on buses don’t like people with Tupperware. – Pampered Chef parchment paper is wonderful. I’m so glad the no name stuff was sold out and this was on sale. It lasts FOREVER. – Colourful sprinkles improve cookies by a tenfold. I’m also addicted to photographing cookies. Here’s what you’re stuck with. Oh yeah, and here are some of the other cookies I’ve made for classmates over the past month…Instagram-ified Not pictured: peanut butter stuffed chocolate cookies. They were good. Sift flour, soda and salt with a wire whisk and set aside. Beat butter and peanut butter. Add flour mixture and combine. Roll dough into 1 to 1-1/2 inch balls and then roll the balls in sugar to coat. Bake on a parchment paper lined cookie sheet for 10-12 minutes or until slightly firm. Remove from oven and press a single chocolate kiss into the centre of the cookie. Let cool. Preheat the oven to 350 degrees F. Line two cookie sheets with parchment paper. Mix 4 tbsp sugar and sprinkles in a small bowl. Sift together the flour, baking soda, salt, and spices. In a separate large mixing bowl, mix together the oil, molasses, soy milk, sugar, and vanilla. Pour the dry ingredients into the wet and combine well. Roll into 1-inch balls, and roll in the sugar/sprinkles bowl, coating all over. Place 1 inch apart sugar side up on a prepared cookie sheet. Bake 10 to 12 minutes (don’t overbake! ), let cool on cookie sheets for 3 to 5 minutes, and transfer to a cooling rack. Combine eggs and the vanilla together. Add the dry ingredients, mixing until just combined. Add your random chocolate(s) of choice. Cover the bowl and allow it to sit in fridge for an hour. Use a cookie scoop to plop 1 1/2-inch balls onto a parchment paper lined cookie sheet. Bake until soft on top, but not mushy, about 10 minutes. Remove and let cool. Makes a whopping five dozen. But on a more serious note…can we be coworkers? I am an excellent cookiemonster. Well I see we’re in each others Cap News class next semester and I bake for my classmates even more than I bake for my co-workers! Cookie monsters are good friends to have. I like your pin wheel cookies the best. They remind me of something the Grinch would steal from Whoville. Merry Christmas! Thanks, Jennifer! I loved how those turned out too. Pin wheel cookies are a lot of work, but the result is so fun. 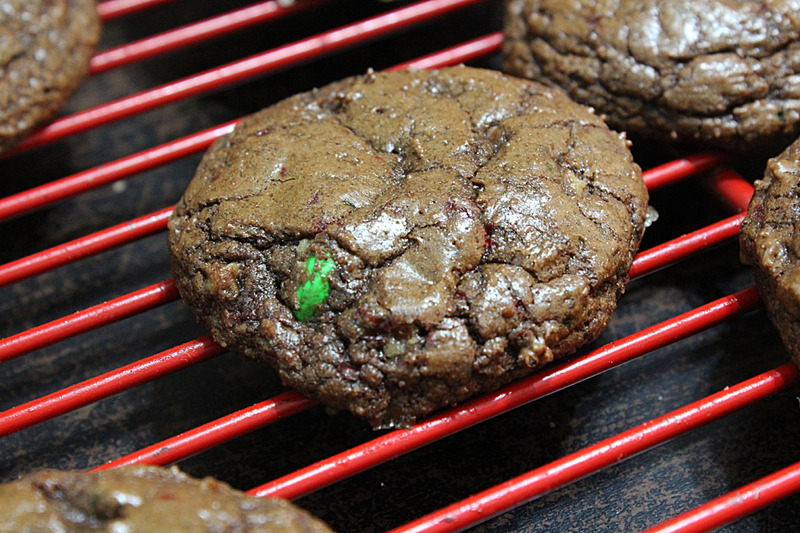 I only wish I had sprinkles to line the edges – they would have been even more Grinch-like then! So, I’ve just spent the evening baking your Peppermint double chocolate cookies with my heart sister. She’s in love now and won’t eat anything else than those cookies. Dangerous stuff :) Seriously, though. They are amazing. We adapted a little bit so that they wouldn’t be quite so sweet, and had a whole giant tube of smarties in them. yummy. Oh man, those were my absolute favourite ones! I think I under-baked mine a bit, so they were still so soft and almost like delicious cookie brownies. I’m glad you and your heart sister liked them! I may be on the hunt for Smarties around the Valentine’s Day season, so I’ll keep you and Freya updated. Words cannot describe how much I would like a Smarties supplier :) Merry belated Christmas to you and Happy New Year! Just let me know, then. They’ll need about 3 weeks to get to you. WOW, some amazing looking cookies Hilary. Great to get you into the Christmas mood.